Eighteen months after waging an unsuccessful and ultimately hostile takeover attempt, ConAgra Foods Inc. on Nov. 27 announced it struck a definitive agreement to acquire Ralcorp Holdings Inc. for $90 per share in cash. The transaction is valued at approximately $6.8 billion, including the assumption of debt. ConAgra must have really wanted this deal and the private label base it brings, because the Omaha, Neb., company offered Ralcorp $86 per share in mid-2011, when the St. Louis company owned the $800 million Post cereals business – which it no longer does. The boards of directors of both companies have unanimously approved the deal. The $90 per share price tag was a 28 percent premium over the closing price of Ralcorp’s common stock the day before. This transaction would appear to vault ConAgra from No. 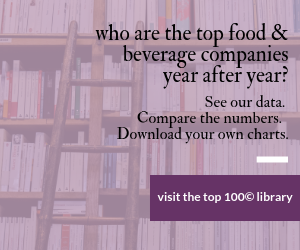 13 on our Top 100© companies list of the largest food manufacturers in the U.S. and Canada to No. 5, with sales of approximately $18 billion annually and more than 36,000 employees. Ralcorp’s annual sales are approximately $4.3 billion. It also positions ConAgra as the largest private label food business in North America, with combined private label sales of approximately $4.5 billion. Ralcorp already held that title, but ConAgra has had a significant but low-key private label business, which we estimate at nearly $1 billion. Ralcorp also has a branded and commercial/foodservice portfolio. Gary Rodkin, chief executive officer of ConAgra Foods said, “We are very pleased to have reached an agreement with Ralcorp after a period of collaborative dialogue between the two companies. The acquisition of Ralcorp is a logical and exciting step for ConAgra Foods. Adding Ralcorp provides us with a much larger presence in the attractive and growing private label segment and accelerates our Recipe for Growth strategy. The transaction will allow us to apply our scale and combined operational expertise to this important growth area, and will strengthen our position as one of the leading food companies in North America. “We believe the balanced combination of our very significant branded food business, the largest private label food business in North America and our important commercial food businesses will enable ConAgra Foods to deliver even greater value and innovation to our customers and consumers, and sustainable profitable growth to our shareholders,” Rodkin continued. Ralcorp has strengthened its leadership position in private label through recent acquisitions and enhanced customer relationships – and, in some ironic way, with the February spinoff of its branded Post cereals business. Ralcorp and ConAgra claim their portfolios are a complementary fit with very little overlap. Ralcorp’s products include cereal, pasta, crackers, jellies and jams, syrups and frozen waffles. The parties expect the transaction to close by March 31, 2013. ConAgra expects to achieve approximately $225 million of cost synergies on an annual basis by the fourth full fiscal year after closing. To end ConAgra’s takeover attempts, which became public in May 2011, Ralcorp spun off Post Foods to then-current shareholders.